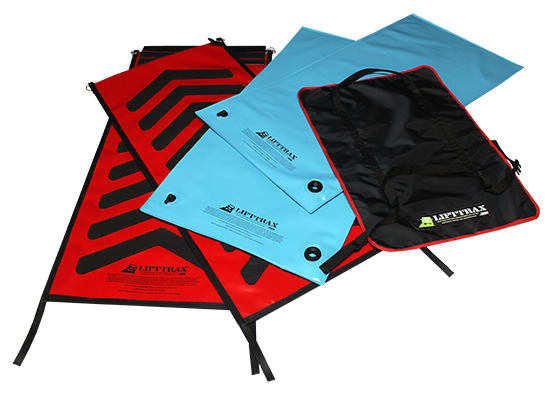 LiftTrax™ inflates to approximately 320mm high or double LiftTrax™ over for 390mm to 410mm. LiftTrax™ can hold up to 4 tons. LiftTrax™ should be operated between 1 to 3 PSI but no more than 5 PSI. NOTE: we preassemble LiftTrax™ for you and ship via Australia Post and their International partners... standard shipping is 5 to 10 business days depending on your location. Help get an Australian Business up and running by either pre-purchasing or support us with as little as $1... every cent counts. Sadly HiGoTec™ hired an expert con-artist in 2015/2016 that sucked over $150,000 out of the company and Murray is trying to recover from that but needs your help. Murray has spent every cent he has getting to this point and we are all ready to go other than some additional equipment and the materials. The cost of a cup of coffee or a beer will really help get LiftTrax™ by HiGoTec™ running... please help. Although it is important, and recommended to read all the terms and conditions, as You must agree with them, in a nutshell HiGoTec™ is a reputable company and all of our terms and conditions are standard. The “Product”, “Service”, “Software”, “System” or “Website” refers to anything created or supplied by HiGoTec™. HiGoTec™ refers to HiGoTec™ Pty Ltd (ABN 16 144 867 176), a company registered in Australia with the registered postal address of PO Box 278, Fortitude Valley QLD 4006, all HiGoTec™ websites, Murray Barnes and any person or entity involved directly or indirectly with the production or sale of any Product, Service or Software. “You” and “'Your”' refers to the individual, company, entity, Your heirs, agents or successors contracting or using HiGoTec™ to purchase or produce a Product, Service or Software. In order to use any of the HiGoTec™ Websites, Systems, Products, Services or Software You must first agree to the Terms. You must not use the HiGoTec™ Websites, System, Products, Services or Software and may not accept the Terms if You are not of legal age to form a binding contract with HiGoTec™. By using the HiGoTec™ Websites, Systems, Products, Services or Software or purchasing or using any HiGoTec™ Websites, System, Products, Services or Software You agree to all the Terms. Please read the Terms carefully and understand them, before ordering any HiGoTec™ Websites, Systems, Products, Services or Software. You should understand that by ordering any of the HiGoTec™ Websites, Systems, Products, Services or Software, You accept the Terms. You may print a copy of the Terms for future reference. We reserve the right to amend the Terms from time to time with or without notice. Whenever You wish to use the HiGoTec™ Websites, Systems, Products, Services or Software, please check the Terms to ensure You understand the Terms which will apply at that time. 1.1 A Physical Product is anything sold by HiGoTec™ that can physically be touched and used and is generally posted or picked up and is not sold to be used electronically. 2.1 HiGoTec™ warrants that all Products are substantially free from defects in materials and workmanship under normal use for the period of One Year from the Date of Purchase, unless otherwise stated in writing with the Product or under the Warranty & Returns tab for a specific Product. 2.2 You, in turn, indemnify HiGoTec™ from any loss, including consequential loss, damage, costs or any claim arising from the use of any HiGoTec™ Product. 2.3 If You, or a third person, misuse, neglect, physically abuses, drops, wets, opens, repairs, tampers with, uses as not instructed or adversely affects the Product in any way You may not be covered under Warranty. 2.4 All warranties are Return To Base unless otherwise stated in writing with the Product or under the Warranty & Returns tab for a specific Product. 2.5 All warranties are non-transferrable. 2.6 You must have proof of purchase for any warranty claim. 3.1 A Non-physical Product, Service or Software is anything sold by HiGoTec™ that cannot physically be touched and used and is generally sold and used online and is delivered electronically. 4.1 HiGoTec™ is not responsible in any way, shape or form for the content supplied by or added by You to the System. Content includes but is not limited to text, images, code, logos, quotes etc. 4.2 Any fines or charges due to illegal content which has been supplied by or added by You to the System will be the sole responsibility of You. You hereby indemnify HiGoTec™ and shall continue to indemnify HiGoTec™ for all or any such fines or charges. 4.3 You give HiGoTec™ full, unrestricted rights to use any and all of Your Copyright Works solely for the purpose of the production of the Product or Service. 5.2 You agree to indemnify and hold harmless HiGoTec™ from any claims resulting from the use of the Service which damages You or any other party. 5.3 HiGoTec™ will be the sole arbiter as to what constitutes a violation of this provision. 5.4 HiGoTec™ reserves all rights to suspend the Product or Service from any location if there is any breach of this term. 6.1 HiGoTec™ takes no responsibility for the actions of any third parties used in the development or hosting of any Products or Services. 6.2 Any recommendation or agreement made through or by HiGoTec™ on Your behalf relating to third parties, such as web hosting or domain name hosting, falls on the terms and conditions laid out by the third party and HiGoTec™ cannot be held responsible or liable for any downtime or loss. 6.3 Any issues created by a third party and directed to HiGoTec™ to research or resolve will incur a charge payable by You at the sole discretion of HiGoTec™. 7.1 Unless otherwise agreed in writing by HiGoTec™, the copyright and all other rights relating to any Software provided to You by or on behalf of HiGoTec™ pursuant to this agreement (the "Intellectual Property") will remain the property of HiGoTec™ or where applicable its licensors. This includes but is not limited to HTML, PHP, AJAX, ANGULAR, jQuery, databases, style sheets, scripts, scripting, images, website design, Bootstrap design and layouts and content supplied by HiGoTec™. 7.2 Upon payment in full for the services provided by or on behalf of HiGoTec™ pursuant to these Terms, HiGoTec™ grants You a non-exclusive and non-transferable perpetual license to use the Intellectual Property for Your own purposes. 7.3 HiGoTec™ warrants to You that, to the best of its knowledge, it has the right to grant the licenses referred to in these Terms, and the use by You of any Software, Product or Service provided by HiGoTec™ will not infringe the rights of any third party. 7.4 You must not copy any of the Intellectual Property for any purpose. 7.5 You must not de-compile, disassemble, decrypt, extract or otherwise reverse engineer any part of any Software or parts of the System that are provided to You by HiGoTec™ without HiGoTec's™ prior written consent. 7.6 You must hold any Software (in source and/or in object code) and other materials provided to You by HiGoTec™ confidential. You must not disclose any of those materials to any third party without HiGoTec™ prior written consent. You must also take all reasonable steps within Your power to protect the Intellectual Property of HiGoTec™. 7.7 You agree to pay a $10,000 breach payment for each breach of any of the Intellectual Property Terms made by You or anyone You gave access to within seven (7) days. You also agree to pay any court costs or fees associated in collecting this payment. 8.1 None of the Software or System provided pursuant to these Terms are designed or intended to be fault-tolerant or designed or intended for use where their failure or malfunction could lead to economic damage. 8.2 You warrant that You will not distribute or resell any Product, Service or Software without the written permission of HiGoTec™. 8.3 You will ensure that permitted end-users of such Products, Services or Software have their own HiGoTec™ Identity. 8.4 You will indemnify HiGoTec™ for any loss, cost, damage or third party claim arising from Your use of any Product, Service or Software or from any breach by You of this clause. b) Notwithstanding any other provision of these Terms, in no event will HiGoTec™ be liable to any party including You for any indirect, punitive, special, incidental or consequential damages in connection with or arising out of these Terms (including for loss of income, profits, use, data, or other economic advantage), however it arises, whether for breach of these Terms or in tort, and even if HiGoTec™ has been previously advised of the possibility of such damage. Further, liability for such damages shall be excluded, even if inclusive remedies provided hereunder fail their essential purpose. You will indemnify HiGoTec™ and keep it indemnified from and against any claims by any third party for or in respect of such damages. II. the payment of the cost of having the Services or Software supplied again. 10.1 Access to the Website and System is permitted on a temporary basis, and we reserve the right to withdraw or amend the Website and System without notice. We shall not be liable if, for any reason, the Website and System is unavailable at any time or for any period. 10.2 From time to time we may restrict access to parts of the Website and System, or the entire Website and System, to users who have registered. 10.3 You must treat any username, password or any other piece of information provided as part of our security procedures as confidential and not disclose it to any third party. We reserve the right to disable any username or password, whether chosen by You or allocated by us, at any time, if (in our opinion) You fail to comply with the Terms. 10.4 You are responsible for making all the arrangements necessary to have access to the Website and System. You are also responsible for ensuring that persons who access the Website and System through Your internet connection are aware of the Terms and comply with them. Please notify us as soon as possible if You become aware that activities on Your account are unauthorised or You have become aware that Your account details have been compromised. 10.5 While we will make reasonable efforts to ensure that the information on the Website and System is correct, the material displayed on it is provided without any guarantees, conditions or warranties as to its accuracy, including, but not limited to, information about the Products, Services and Software and prices described in it. 10.6 The availability of the Products, Services and Software which are the subject of Your order will be determined by the Product, Service or Software description displayed on the Website and System at the time of placing Your order. We will make reasonable efforts to ensure that any Product, Service or Software description is a fair representation of the actual Products, Services or Software offered. 11.1 You must not misuse the Website and System by knowingly introducing viruses, Trojans, worms, logic bombs or other material which is malicious or harmful. You must not attempt unauthorised access to the Website and System, the server on which the Website and System is stored or any server, computer or database connected to the Website and System, or attack the Website and System via a denial of service attack, distributed denial of service attack or other similar means. 11.2 We will not be liable for any loss or damage caused by a distributed denial of service attack, viruses or other harmful material that may infect your computer equipment, computer programmes, data or other proprietary material due to your use of the Website and System or downloading any material posted on it or any website linked to it. 12.1 Applicable laws require that some of the information or communications we send to You should be in writing. When using our Website and System, You accept that communication with us will be mainly electronic. We will contact You by email or provide You with information by posting notices on our Website and System. For contractual purposes, You agree to this electronic means of communication and You acknowledge that all contracts, notices, information and other communications that we provide to You electronically comply with any legal requirement that such communications be in writing. This condition does not affect Your statutory rights. 13.1 You will provide HiGoTec™ all reasonable assistance and facilities free of charge (including without limitation of the means of access and the other items referred to in this document, office facilities, and liaison with the necessary officers and employees of You) in order to permit HiGoTec™ to efficiently provide the Products, Services or Software. 14.1 You acknowledge that HiGoTec™ is providing the Products, Services or Software to You on a non-exclusive basis and that HiGoTec™ may provide Products, Services or Software of the same or a similar nature as the Products, Services or Software to any other party. 15.1 All prices are shown and charged in Australian Dollars (AUD) and include GST unless otherwise stated. 15.2 All Products, Services and Software that require payment is charged upfront and in advance for the period stated when purchasing. 15.3 Payment needs to be made as stated in the payment type. Any transfer fees or charges, subject to the terms and conditions laid out by Your financial institution, must be paid by You. 15.4 HiGoTec™ reserves all rights to suspend a Product, Service or Software from any location if any payment due is outstanding for more than seven (7) days. 15.5 If payment is outstanding for more than thirty (30) days Your Product, Service or Software will be terminated and all outstanding monies will become due immediately. 15.6 All payments are for the purchased period and are non-refundable unless they fall under the Money Back Guarantee or if required by law. 15.7 HiGoTec™ accepts Visa and MasterCard credit or debit cards and PayPal for payment. We do not accept Amex directly however we do accept any payment method supported by PayPal. c) Your recurring payment is on the 29th or 30th of the month... in this case, in February, Your recurring payment will be taken out on the 28th. 16.1 On Products, Services or Softwares that has a Money Back Guarantee Your money will be refunded if You make a Monday Back Guarantee claim within the Money Back Guarantee period stated on the Product, Service or Software. 16.2 If You request for Your money back after the Money Back Guarantee period it is at HiGoTec's™ sole discretion if Your money will be given back. 16.3 All money returned under the Money Back Guarantee will be credited to Your HiGoTec™ Bank Account to be used within HiGoTec™. 17.1 HiGoTec™ reserves the right to make any price changes as it sees fit. 17.2 Any price changes will come into effect as stated with the price change. c) from time to time it may be necessary to increase the price of upfront payment Products, Services or Software without notice... if You have already purchased a Product, Service or Software You will pay the price You purchased at the time... if You have not made a purchase before the price increase You will need to pay the updated price. ii) if You pay annually You will be given a minimum of 2 months notice however at renewal Your invoice will be split into the current and new amount... EXAMPLE: if You are paying $240 per year ($20 per month) and there is a price increase to $265 and Your renewal is due straight away then You will be charged 2 months at $240 per year and 10 months at $265 per year. b) the price decrease will become effective on Your next renewal date. 18.1 There are no refunds given on any subscriptions... a subscription is purchased for the period of the subscription... if You cancel Your subscription early that is Your choice but no refund for the unused portion will be given. 18.2 If a refund is issued it will be refunded to Your HiGoTec™ Bank Account. 19.1 If payment for a specific Product, Service or Software is overdue for seven (7) days that Product, Service or Software will be suspended until payment has been made. 19.2 If a Product, Service or Software is suspended for any reason under these Terms a suspension page will be shown and will remain until the suspension issue has been rectified. 20.1 Once the suspension issue has been rectified Your Product, Service or Software will be reactivated. 20.2 If the reactivation requires non-human input and is performed automatically by the System, there will be no additional charge. 20.3 If the reactivation requires human input there may be an additional charge payable to reactive Your Product, Service or Software at the sole discretion of HiGoTec™. 21.1 If You want to terminate a Product, Service or Software it must be done individually for each Product, Service or Software by going to the relevant license section in Mission Control and cancelling the Product, Service or Software. 21.2 The Product, Service or Software will be terminated immediately unless otherwise stated. 21.3 HiGoTec™ reserves the right to terminate any Product, Service or Software, with or without notice if any of these Terms are breached. 21.4 Upon termination, however occurring, any unused Product, Service or Software payments are non-refundable. 21.5 Upon termination, however occurring, You forfeit Your Product, Service or Software and all information, data and anything using System resources will be deleted and will not be restorable other than any information that needs to be kept to maintain the System and as required by law such as invoices, contact details and such. a) You consent that HiGoTec™ may use extracts from Your Product, Service or Software where that Product, Service or Software for demonstration purposes to other parties. This includes but is not limited to screenshots, links to Your Product, Service or Software, usage of Your domain name on letters, Curriculum Vitae’s, websites and other materials provided always that such use does not mislead the public into believing that the Product, Service or Software is HiGoTec™ nor that You and HiGoTec™ are affiliated. b) You agree that ‘Developed and maintained by HiGoTec™ Email and Web Services’ will be discreetly displayed on the bottom right-hand corner of Your website. 23.1 You may not assign any of Your obligations under these Terms without the prior written consent of HiGoTec™, which consent shall not be unreasonably withheld. However HiGoTec™ may arrange for subcontractors or employees to perform any of HiGoTec™ obligations under these Terms. 23.2 HiGoTec™ will not be liable to You or to any third party for any non-performance or delay in the performance of its obligations under these Terms if events or conditions beyond Your reasonable control cause the non-performance or delay and HiGoTec™ gives You prompt notice thereof. In no event will this provision affect Your obligation to make payments to HiGoTec™ under these Terms except in respect of Products, Services and Software that are unable to be performed by HiGoTec™, until they can be performed. 23.3 A failure, delay, relaxation or indulgence by either party in exercising any right, power or privilege conferred on the party by this agreement shall not operate as a waiver of the power or right. A single or partial exercise of any right, power or privilege hereunder does not preclude the further exercise of the same right or the exercise of any other right hereunder. A waiver of a breach does not operate as a waiver of any other breach. 23.5 Should any dispute arises under this agreement then the parties agree to attempt to resolve the dispute before either of them shall institute proceedings in a court of competent jurisdiction. The party with the grievance shall first serve a notice on the other party setting out the nature of the dispute and stating how the party wants to resolve the dispute. The other party shall respond within fourteen (14) days. If the dispute is not resolved the parties agree to attend mediation within thirty (30) days in an attempt to resolve the dispute. If the dispute is not resolved in forty-five (45) days the parties shall be at liberty to take such further action as they consider appropriate. The rules relating to this clause and how it will be put into effect shall be in accordance with the dispute resolution rules as set out by The Law Society, Queensland, Australia. 23.6 These Terms shall be governed by and construed in accordance with the laws in force in the State of Queensland, Australia. We keep Your information private and secure and only use and share it to deliver the best service to You. In order to use any of the HiGoTec™ Websites, Systems, Products, Services or Software You must first agree to the Terms. You must not use the HiGoTec™ Websites, Systems, Products, Services or Software and may not accept the Terms if You are not of legal age to form a binding contract with HiGoTec™. Please read the Terms carefully and understand them, before ordering any HiGoTec™ Websites, System, Products, Services or Software. You should understand that by ordering any of the HiGoTec™ Websites, Systems, Products, Services or Software, You accept the Terms. You can choose not to provide us with certain types of information, but if You do so we may not be able to provide You with certain HiGoTec™ Websites, Systems, Products, Services or Software or it may affect Your ability to use or receive some HiGoTec™ Websites, Systems, Products, Services or Software. Subject to the direct marketing section below, we may also use Your information for marketing purposes. We may sometimes also collect personal information for assessment and analysis of our market, customers and services, to enable us to monitor, review and improve the HiGoTec™ Websites, Systems, Products, Services or Software which we offer and for internal record keeping. We may collect information from You in customer surveys, prize draws, competitions or promotions. We may also use this information to monitor or improve customer satisfaction and (subject to the direct marketing section below) for marketing purposes. You may also choose to provide us with Your name or other contact details when You call us by phone, write to us or email us, so that we can respond to Your query and send You information about our Products and Services. HiGoTec™ also collects personal information in relation to its general business operations and administration. This may include information about individuals who are, or are employed by, our suppliers (including service and content providers), contractors, dealers, related companies, agents, advisors, corporate customers and business partners. Such as Your hardware model, IMEI number and other unique device identifiers, MAC address, IP address, operating system version, and settings of the device You use to access the HiGoTec™ Websites, Systems, Products, Services or Software. Such as the time and duration of Your use of the HiGoTec™ Websites, Systems, Products, Services or Software, search query terms You enter through the Services, and any information stored in cookies or sessions that we have set on Your device. Such as Your device's GPS signal or information about nearby WiFi access points and cell/mobile towers that may be transmitted to us when You use certain HiGoTec™ Websites, Systems, Products, Services or Software. About Your use of the HiGoTec™ Websites, Systems, Products, Services or Software, such as the apps You use, the websites You visit, and how You interact with content offered through the HiGoTec™ Websites, Systems, Products, Services or Software. We may collect other information about You, Your device, or Your use of the Services in ways described to You in any applicable terms and conditions or collection statements. - Provide customised content and advertising. - the HiGoTec™ Family of companies. - Business partners, trusted companies that may provide information about products and services You might like. - Service providers and suppliers, including companies that provide services to, for, or on behalf of HiGoTec™. - Law enforcement when we are required to do so or to protect HiGoTec™ and its users. Your information may be shared among HiGoTec™ Affiliates. We may disclose Your information to any company in the HiGoTec™ Group (which includes our affiliates and related companies, contractors to whom we have outsourced the provision of Services to our customers and any other entity operating under the HiGoTec™ brand name with authority from HiGoTec™). We also may share Your information with trusted business partners, including wireless carriers. These entities may use Your information to provide You with services You request, make predictions about Your interests and may provide You with promotional materials, advertisements and other materials. We also may disclose Your information to our service providers, suppliers, contractors, dealers, distributors, resellers, repair centres, agents, and business partners who help us deliver the HiGoTec™ Websites, Systems, Products, Services or Software to You or provide services for or on behalf of us, such as companies that help us with billing or that send emails on our behalf. We may disclose Your information to professional advisors in the course of obtaining professional advice. - to protect the rights, property, or safety of HiGoTec™, or any of our respective affiliates, business partners, or customers. We may disclose Your information to a third party as part of a merger or transfer, or in the event of a bankruptcy. We may disclose Your personal information to anyone to whom our assets or business (or any part of it) is transferred. We offer a variety of choices about how we use Your information. You can make choices about whether to receive promotional communications from us by following the unsubscribe instructions included in the communication. In some cases, You may be able to make choices in specific Services or when we give You a collection statement. You can view and update your personal information in your HiGoTec™ Mission Control. Some information may not be directly linked to your personal information such as IP addresses and other tracking and usage information. We have put in place reasonable physical and technical measures to safeguard the information we collect in connection with the HiGoTec™ Websites, Systems, Products, Services or Software. However, please note that although we take reasonable steps to protect Your information, no website, Internet transmission, computer system or wireless connection is completely secure. Our Services may link to third-party websites and services that are outside our control. We are not responsible for the security or privacy of any information collected by third-party websites or other services. You should exercise caution, and review the privacy statements applicable to the third-party websites and services You use. We also may make available to You certain products or services developed by third parties. HiGoTec™ is not responsible for these third-party products or services. Certain third parties may serve advertising or keep track of which advertisements users see, how often they see those advertisements, and what users do in response to them. - Cookies help us and third parties understand which parts of the HiGoTec™ Websites, Systems, Products, Services or Software are the most popular because they help us to see which pages and features visitors are accessing and how much time they are spending on the pages. By studying this kind of information, we are better able to adapt the Services and provide You with a better experience. - Cookies help us and third parties understand which ads You have seen so that You don't receive the same ad each time You access a Service. - Cookies help us and third parties provide You with relevant content and advertising by collecting information about Your use of our Services and other websites and apps. When You use a web browser to access the HiGoTec™ Websites, Systems, Products, Services or Software, You can configure Your browser to accept all cookies, reject all cookies, or notify You when a cookie is sent. Each browser is different, so check the “Help” menu of Your browser to learn how to change Your cookie preferences. The operating system of Your device may contain additional controls for cookies. Please note, however, that some HiGoTec™ Websites, Systems, Products, Services or Software may be designed to work using cookies and that disabling cookies may affect Your ability to use those HiGoTec™ Websites, Systems, Products, Services or Software, or certain parts of them. We, along with certain third parties, also may use technologies called beacons (or “pixels”) that communicate information from Your device to a server. Beacons can be embedded in online content, videos, and emails, and can allow a server to read certain types of information from Your device, know when You have viewed particular content or a particular email message, determine the time and date on which You viewed the beacon and the IP address of Your device. We and certain third parties use beacons for a variety of purposes, including to analyse the use of the HiGoTec™ Websites, Systems, Products, Services or Software and (in conjunction with cookies) to provide content and ads that are more relevant to You. We use sessions to store information to make your HiGoTec™ Websites, Systems, Products, Services or Software work while you are using them. We, along with certain third parties, may use other kinds of local storage technologies, such as Local Shared Objects (also referred to as "Flash cookies") and HTML5 local storage, in connection with our Services. These technologies are similar to the cookies discussed above in that they are stored on Your device and can be used to store certain information about Your activities and preferences. However, these technologies may make use of different parts of Your device from standard cookies, and so You might not be able to control them using standard browser tools and settings. For information about disabling or deleting information contained in Flash cookies, please click here. We may also use or disclose Your personal information to provide You with information about products, promotions, special offers and other information which relates to the HiGoTec™ Websites, Systems, Products, Services or Software or which we believe may be of interest to You. We may send You such information by email, telephone, SMS text message and/or any other form of electronic messages, post, fax or smartphone applications, social networking websites or any other method which becomes relevant from time to time. When You provide us with information about Yourself, You will usually be given the option to let us know that You do not want that information to be used for direct marketing purposes. You can change Your mind about Your preferences in respect of direct marketing and make choices at any time by following the unsubscribe instructions included in the relevant communication, or by contacting our Privacy Officer. If You have any questions or wish to access or correct Your personal information, make a complaint or change Your preferences in respect of direct marketing, please Contact Us. Please use the Contact Us section of any of the HiGoTec™ Websites or email info@higotec.com. We follow the Australian Law with our Warranty and Returns... before sending any Product back you need to contact us first and have written confirmation. HiGoTec™ Pty Ltd (ABN 16 144 867 176) of PO Box 278, Fortitude Valley Queensland 4006, Australia, warrants to the Customer that this Product is substantially free from defects in materials and workmanship under normal use for the period of One (1) Year from the Date of Purchase. You, in turn, indemnify HiGoTec™ from any loss, including consequential loss, damage, costs, non-performance or any claim arising from the use of your LiftTrax™ by HiGoTec™. Your LiftTrax™ by HiGoTec™ is covered under Warranty for normal domestic use ONLY. Make sure you read the Instruction Manual for the correct use of LiftTrax™ by HiGoTec™ or go to lifttrax.com to download a copy. Your LiftTrax™ by HiGoTec™ is covered for manufacturing faults... every set of LiftTrax™ by HiGoTec™ are tested and checked before being shipped to you so Warranty Claims are very rare. If you, or a third person, misuses, neglects, physically abuses or uses your LiftTrax™ by HiGoTec™ in any way not covered in the Instruction Manual your Warranty may become Void. Commercial use, misuse or mistreatment will Void your Warranty. This Warranty is non-transferable... the Warranty only covers the original purchaser. At the end of the One (1) Year Warranty period your Warranty becomes Void. You MUST be the original purchaser, have proof of purchase and have your Warranty Registered at lifttrax.com to make a Warranty Claim. You can make a warranty claim within One (1) Year from the Date of Purchase by visiting lifttrax.com, logging into your account and completing the Warranty Claim Form... you will then be given further instructions. Your Warranty is a Return To Base Warranty. Do not send your LiftTrax™ by HiGoTec™ back without written confirmation from HiGoTec™... if you have not had confirmation of your Warranty Claim and you send your LiftTrax™ by HiGoTec™ back you run the risk of your Warranty Claim being rejected and your return sent back to sender. Under Australian Law we do not need to accept returns if you simply change your mind or do not want your LiftTrax™ by HiGoTec™ anymore. There is a 40% restocking fee imposed to cover the original shipping and fees, checking and retesting the return and repackaging the LiftTrax™ by HiGoTec™ for resale. You must contact us and get written confirmation before making any returns. If you return a Product without written confirmation it will not be accepted and returned to sender. If a return is accepted and when we receive it we determine that it has been used and is not suitable for resale, at our sole discretion, you will be given the option to either have the Product shipped back to you, at your expense, or abandon the Product with us.